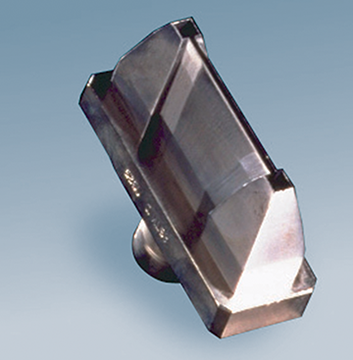 Tests at low temperatures permit to evaluate the crystallization effects and to compare viscoelastic properties of rubber and rubber-like materials at low temperatures. Temperature Retraction and Brittleness Point tests are useful for the selection of materials suitable for low-temperature service. The structure of the Low Temperature Check has been designed to permit the installation of arrangements for TR and Brittleness point tests. - 5 litres thermal insulated stainless steel bath for cooling liquid. - compressed air pressure control and cleaning system. - electronic card for the complete control fitted with usb port for connection to pc. 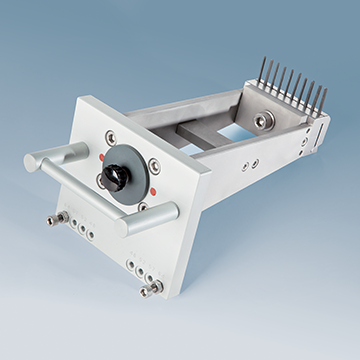 - safety devices: independent bath overheating controller, thermal switch, pneumatic lock for sample holders. The bath cooling devices provided by Gibitre can be either a nitrogen tank or a refrigeration unit. The regulation of the cooling is automatically controlled by the instrument according to the temperature set of the test procedure in use. - carry out simultaneous testing on 6 samples. - automatically release of test samples at the end of the conditioning time. 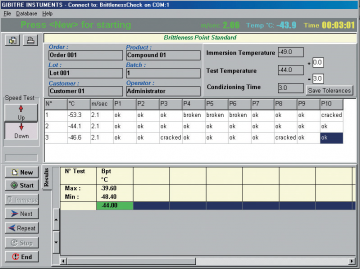 The software permits to prepare and store test procedures with custom defined test conditions. 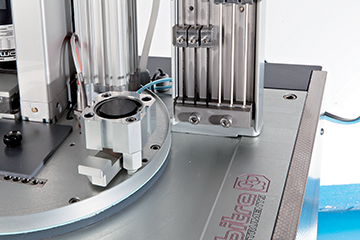 - the temperature of the cooling bath is automatically adjusted to the set value for sample immersion. - when the immersion temperature has been reached, the operator is asked to insert the samples. - after immersion, the instrument automatically regulates the conditioning temperature according to the requirements of the standards and measures conditioning time. - the test is started and the temperature is increased with 1°/min. gradient in conformity with the standards. 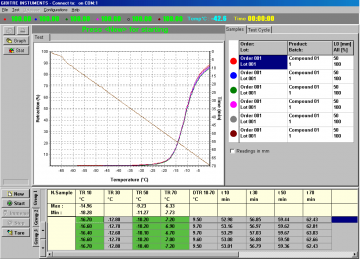 - the retraction curves, the temperature vs. time curve for each sample are automatically drawn until the set final temperature is reached. - for each group of samples, statistic results (max. min. mean, standard deviation, Cp, Cpk) are calculated. - at the end of the test, independent test reports for each group of samples can be prepared. 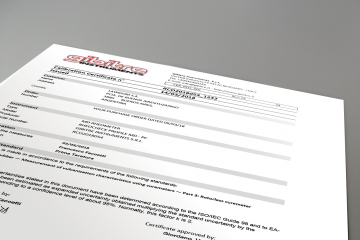 The test report may include: customer logo, complete test identification, test conditions, sample initial length and % elongation, test curves, test results, test statistics, tolerance limits, legend of results, operator digital signature. 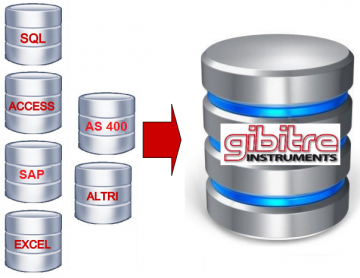 - test results and test curves for each sample are saved in Gibitre Standard database. - Datagest software for database management. The striker is in compliance with international standards and the clearance can be set according to the kind of test (4.8, 5.2, 5.7, 6.4 mm). A pneumatic piston drives the striker and permits to perform the tests while the samples are immersed in the cooling liquid. A pressure regulator enables the speed of the striker to be adjusted in compliance with standards depending from the number of samples and the density of the cooling liquid in use. The software permits to prepare and store test procedures with custom test conditions. - when the immersion temperature has been reached, the user is asked to insert the samples. - at the end of the tests, the software automatically calculates the Brittleness Point Temperature and 50% Brittleness Temperature. - at the end of the test a reports can be prepared. The test report may include: customer logo, complete test identification, test conditions, detailed results at the end of each tests step, BPT and 50%BT, operator digital signature. - BTP and 50%BT are saved in the database. - software usage and report printout languages can be selected among the available ones (see table). The regulation of the temperature is performed automatically by the instrument according to the temperature set in the selected test Procedure. TR-Test: TR10,TR30,TR50,TR70,TRx (x customer defined) Time at set TR. 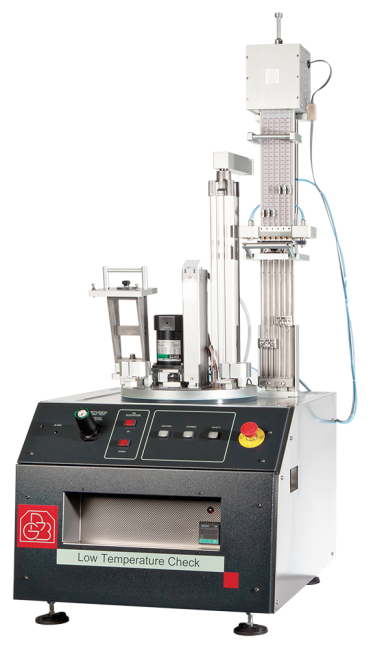 Pneumatic system for lifting sample holder for TR-Test. Sample holder for 10 samples. Test chamber capacity of 5 litres; Stainless steel chamber equipped with mixer to ensure the temperature of the test bath is uniform (ethyl alcohol - silicon oil). Min 6 bar. 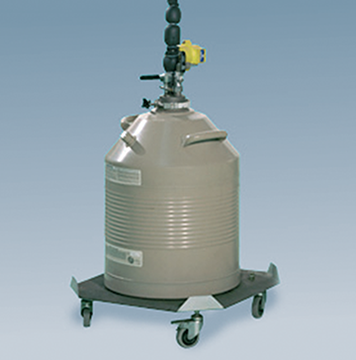 Air treatment unit (cleaning and lubrication) is included. with traceability to primary standards.